If you’re already feeling stressed out about keeping all your resolutions, this tip will be music to your ears. Pick the resolution that is the most important to you and forget about the rest. This makes it much more likely that you will actually keep your resolution, so you won’t have to make the same one next New Year’s Eve. Don’t feel guilty about paring down your list, it is a strategy backed by science. 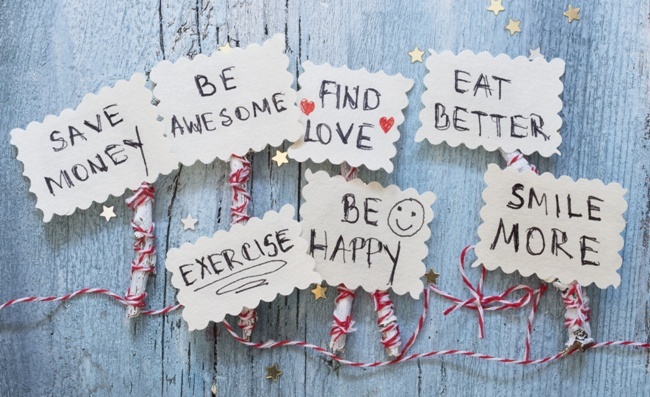 It’s not too late to tweak your resolutions so that they work better for you. Resolutions can be hard to conquer, whereas projects with concrete goals can make the experience fun and easier to keep up with. For example, if your resolution was to get out of a rut, turn it into a project to try one new thing a month. If your resolution was to be more social, your project can be to talk to one stranger a day. These clear projects can help you tackle your resolutions much more easily. When your willpower starts to falter, make sure there are things that remind you of your goals in your environment to help you keep going. Visual cues are extremely powerful, so be sure that you are using them to their fullest extent. “Draw on the strength of images by putting a photo of a thinner you on the fridge, or a picture of a Caribbean beach in your wallet near your credit cards to remind yourself of the vacation that you're saving for,” states Amy Roberts from WebMD.com. Your resolution projects must be achievable and measurable in order for you to succeed. The goal of “getting back in shape,” for example, is not measurable, because being in shape is a subjective concept. Due to the fact that it can’t be measured, you won’t be able to track your progress or ever determine if you have actually reached your goal. Transforming this goal into something measurable such as losing one pound per week or increasing your bench press ability to a certain number helps you stay on course to succeed. Lastly, make sure you are choosing achievable goals, so you won’t be discouraged and give up when you can’t meet them. Starting fresh with a new calendar and new goals is very exciting, so make sure that the excitement and your commitment to your resolutions doesn't fade away in the coming weeks by putting these tips into action.